Some of the best star-gazing in Europe can be experienced during stays in this large and tastefully-furnished bell tent in Limousin. 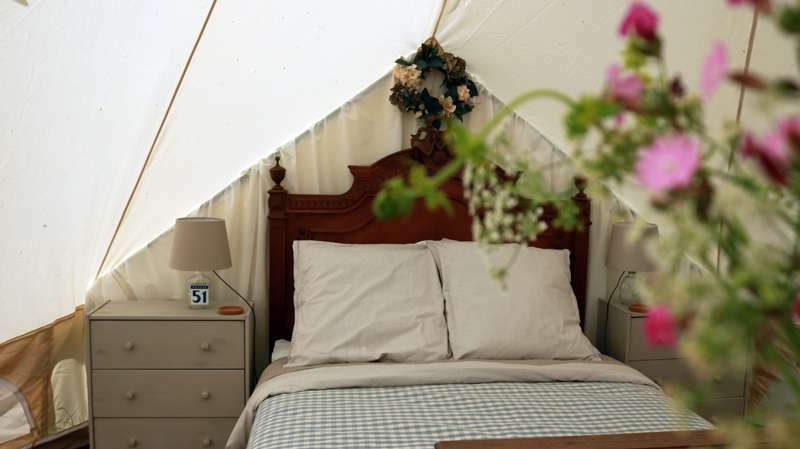 Aurora is a six-metre furnished bell tent. It has a double bed and a day bed that makes into a king sized bed (with two single mattresses) so is suitable for families, couples who appreciate extra space, or perhaps two single people holidaying together. We can add an extra single bed into this tent if children do not want to share the converted day bed - subject to availability - please ask. Eco friendly low energy LED lighting is available in each tent powered by a solar panel for convenience and candlepower for ambience. All our tents are situated on wooden bases and have comfortable outdoor furniture and you can choose to cooking on gas or an open fire: perhaps a gas ring for that morning cup of coffee and the Kadai Fire bowl for barbecues and toasting marshmallows! There are mains-powered fridges and charging points for each tent as well as a cool box inside the tents for the morning milk. A luxuriously-appointed shower room is exclusively yours for the duration of your stay. A ‘Guest Barn’ is kitted out for our guests’ use, and is fully-equipped to cater for up to 20 guests, complete with a range cooker adjacent to our original bread oven, in which we will cook you handmade pizzas. There's also a communal fire pit/barbecue area where everyone can get together for socialising and marshmallow roasting and a beautiful swimming pool surrounded by decking and more comfortable furniture. The site is perfect for star-gazing at night as the light pollution here is some of the lowest experienced in Europe. We are Nigel and Olivia Stanton, who have recently bought a property in France with a big vision of a new future! We have spent many years living and working in the Oxfordshire area in England. Since we married in 1991, every year we have spent holidays camping, caravanning, boating, motorhoming and self-catering, mainly in the UK but also in France. We have learnt to live in bijou spaces without compromising on creature comforts. Over the past couple of years life has dealt us a new set of cards – Nigel was offered redundancy after 26 years in the same company, family responsibilities have lessened and it’s time to escape the daily commute and to realise a long held dream to open a campsite! We began the search for a suitable property and considered all sorts of options along the way, finally deciding upon the Glamping route. Now we are transforming our new property into a peaceful holiday destination for you, your family and friends to enjoy the countryside, with nature all around and rediscovering a simple but comfortable way of life. In May 2018 we opened our small, exclusive, Glamping site on the Limousin/Auvergne border – a beautifully rural area in the centre of France with great transport links by road and air (Limoges airport is an easy 2 hours away and is served with low price flights all year round. Clermont Ferrand airport is just over an hour a way and flights from the UK run during the summer months). ​We will be taking bookings from those needing just one tent, a number of families holidaying together, or even group bookings for the whole site (special birthday, anniversary celebrations, corporate events maybe?). Dogs accepted by prior arrangement. Lighting is powered by the sun and candles. Low energy LED lighting is installed in each tent powered by a solar panel for convenience and candlepower for ambiance. The solar powered unit also has USB ports for charging your 'gadgets'. Cooking on gas or an open fire. Options of a gas ring for that morning cup of coffee and a Kadai Fire bowl, which can be used for barbeques, heating food in the tripod suspended cooking pot, or on a specially designed pan. Alternatively, to sit round in the evening, toasting marshmallows. Your own mains powered fridge. A mains powered fridge for each tent is provided (housed in the old pig sty!) There are also mains sockets for charging electronic stuff. There will also be cool boxes in the tents for the morning milk. Beautiful Swimming Pool surrounded by decking and more comfortable furniture. (The pool has a fence around it for safety reasons). A ‘Guest Barn’ kitted out for our guests’ use, fully equipped to cater for up to 20 guests, complete with a range cooker and a huge banqueting table and is adjacent to our original bread oven, in which we will cook you handmade pizzas on pizza nights. A communal fire pit/barbeque area where everyone can get together for socialising and marshmallow roasting. Star-gazing nights - the light pollution here is some of the lowest experienced in Europe – the picture on our Home Page was taken in the garden on the night we bought the house! All tents are set on wooden decking to ensure a flat, stable base. Proper beds and mattresses, with all bedding and linen provided. Storage chests for clothing and personal items. Low energy LED lighting available alongside candles and, of course, campfires. Options of a gas ring for morning cuppas (complimentary tea and coffee provided) or a Kadai fire bowl, which can be used for BBQs, heating food in the suspended tripod pot or on a specially designed pan. There are cool-boxes in each tent for your morning milk, with a proper, mains-powered fridge in 'the old pig sty' barn. A second barn houses a dining and cooking area, with a range cooker, bread/pizza oven, cooking utensils, pots, pans and crockery, plus gadget charging points. Private, luxury shower rooms in a third, centuries-old barn. Swimming pool, surrounded by decking and furniture. Communal firepit and BBQ area. Bathroom and pool towels both provided. It's 20 miles to Aubusson, world famous for its tapestries. Splash out on a beautiful (and usually pricey) work of art and tour the local galleries. There are plenty of lovely restaurants and shops to visit, too, as well as the main museum. For something more active, drive just under an hour to Lac de Vassivière, the biggest lake in Limousin situated in the north of the Regional Nature Park of Millevaches. Ride bikes around the perimeter, go sailing, kayaking or swimming in the lake itself, or simply enjoy lounging on one of the numerous beaches along its shore. Similarly, Sioule-Loisirs (27 miles; 00334 7385 5287) is a great multi-activity base in the heart of the Sioule Gorges. They offer rental of canoes, kayaks and electric mountain bikes and it's great for families who fancy a spot of adventure. It's a 5 minute drive into Auzances, where there's a handful of small restaurants and cafés (including a pizzeria). Plus, all the basic essentials – three bakeries, a butcher's, a pharmacy, a bank, a post office, a furniture shop... a lawn mower store! For groceries, head to the big Intermarché supermarket just on the other side of the village. Be warned, La Toile Sous Les Etoiles' address is misleading... especially if using a SatNav! It's best to head for the nearest town: Auzances (‘postcode’ 23700). The campsite is around 4km from the town centre. From Auzances follow the D988 towards Dontreix/Pontamur/Clermont Ferrand. After the downhill sweeping bends coming out of the town, you'll cross 2 bridges. After the second, take the second left (the D4A1 towards Vergheas). Follow this road for 2km, passing through the hamlet of Les Vernades, and continue up the hill and around a sharp right hand, then a left hand, bend. Just beyond these bends, you'll see a crossroads sign. Straight ahead you will see 2 entrances in front of you. Take the right hand of these, into a Toile Sous Les Etoiles' car parking area. It's 50 minutes to Montlucon, where you'll find the main railway hub. It's an hour to Clermont Ferrand Airport and 2 to Limoges Airport. By car, Caen is the nearest ferry port (5hrs 25 mins), while it takes 5hrs 50mins to Dieppe or Le Havre. Calais is around 7hrs by car. 4 bell tents sleeping up to 4 people and 2 bell tents exclusively for couples.